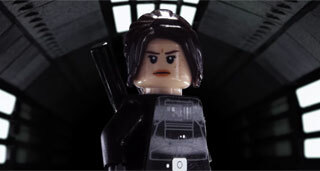 The only thing better than the Rogue One trailer is this LEGO remake of it. Just about a month ago, we saw the first trailer for Rogue One, the newest Star Wars film. Shortly thereafter, we saw that trailer remade in Fallout 4. While that remake was pretty cool, there's a new one out that's even better. Over on the BrotherhoodWorkshop YouTube channel, there's an amazing version of the Rogue One trailer done entirely in LEGO animation. A message at the beginning of the video says it was "animated in under three weeks," an impressive achievement. The trailer was first released on May 4, and you can watch it below. There's a long list of animators who worked on this video available in its description. The channels linked there offer up a ton of really well-animated LEGO videos. Just don't go too far down that rabbit hole if you're at work right now.